A gas pipeline from Israel to Turkey would render the Jewish state hostage to an Islamist regime into the long-range future. The two states enjoyed close relations in the 1990s, when a common world outlook led to a strong military bond, growing trade, and exchanges of people and culture. Writing in 1997, I characterized this bilateral relationship as having "the potential to alter the strategic map of the Middle East, to reshape American alliances there, and to reduce Israel's regional isolation." Israel and Turkey enjoyed close relations before the AKP took power in Ankara in 2002. The almost-unprovoked aggression raised the extreme ire of Russia's President Vladimir Putin. What happened next reprised the schoolyard scene of a lesser bully foolishly annoying the greater bully. Erdoğan more than met his match in Putin, who showed himself a skilled risk-taker and willing to pay a heavy economic price to win his point. 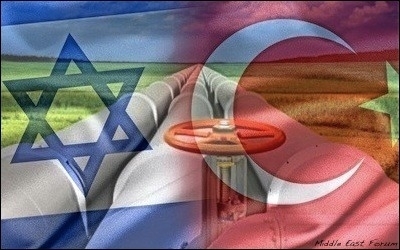 Diminishing Turkish dependence on Russian gas hardly serves Israeli interests. The last makes good sense from Ankara's viewpoint, for Israeli gas would diminish its dependence on Russian gas; but this step hardly serves Israel's interests. Once the Russian threat has passed, Turkish Islamists (will likely be around for a good long while) will resume their old ways, including the bitterly anti-Israel dimension. (Already, since negotiations began, Erdoğan has met with Khaled Meshaal, a Hamas leader.) Because a gas pipeline renders Israel hostage to Turkey into the long-range future, this looks like an imprudent step. Related Topics: Israel & Zionism, Turkey and Turks | Daniel Pipes receive the latest by email: subscribe to the free mef mailing list This text may be reposted or forwarded so long as it is presented as an integral whole with complete and accurate information provided about its author, date, place of publication, and original URL.